Finding the perfect pillow is hard, but I can’t imagine how difficult it would have been going through stacks of hay to find the perfect bundle to sleep on. Throughout history, pillows have evolved nearly as much as mattresses have, and they can tell us quite a bit about the history of sleep as well. 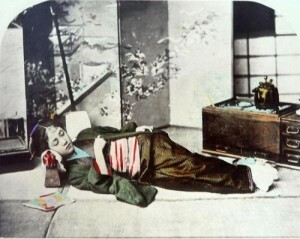 Geisha used small, hard pillows to keep their hair set at night. Pillows have supposedly been around since 7000 BCE, in early Mesopotamia. Of course, they were made of stone and so understandably less comfortable; very unlike what we think of as pillows today. In fact, it is said that these stone pillows were made to help keep bugs from crawling into the ears of wealthier citizens. The ancient Chinese had a similar idea. While the Chinese decorated their pillows much more ornately, they were still made of hard objects—porcelain, stone, bronze, bamboo, or wood. Today, these pillows are sought after by collectors because of their beautiful and elaborate decorations. The Japanese Geisha utilized smaller, but comparable, hard pillows to keep their neck raised off the ground at night. As a result, Geisha ensured that their hair remained perfectly coiffed for days on end. Geisha’s in training would have their heads surrounded by rice at night so that if they fell off the sleeping block rice would stick to their hair. The ancient Greeks and Romans had a slightly better idea of comfort, stuffing their pillows with cotton, reeds, or straw. Although these pillows were nothing like the ones we sleep with today, they were on the path towards modern pillows. Of course, the Middle Ages soon arrived and halted most of the advancements human beings had been making—including pillows. Apparently, you could not even rest your head on a pillow the night before the weekly stretching or toe wedging. Men saw pillows as a sign of weakness, and at one point the only citizens allowed to rest their head at night were pregnant women (and the King). Thankfully, along came the Industrial Revolution, and soon everyone had a pillow to rest their weary heads on after a long day’s work in the factory. Pillows continue to evolve every day. From gel pillows, to boyfriend pillows, there is a pillow out there for everyone. I’m sure someone could even dig up one of those hard pillows to keep your hair set at night, if that’s your thing. Here at Sleep City, we offer a number of pillows designed to suit each individual’s need. All you need to do is check out our pillow selection! Be sure to read about the history of sleep for more sleep knowledge from our experts at Sleep City.